Froot Loops unveils last of this summer's limited-edition products designed to inspire you to do "Whatever Froots Your Loops"
BATTLE CREEK, Mich., Sept. 7, 2017 /PRNewswire/ -- Kellogg's® Froot Loops® has partnered with State Bicycle Co. to create a high-flying single-gear bike that can be customized to "Whatever Froots Your Loops." The Froot Loops x State Bicycle Co. bike was created by State Bicycle Co.'s co-founders Mehdi Farsi, Reza Farsi and Eric Ferguson. Bonded by their mutual passion for cycling, Mehdi, Reza, and Eric carved a path that would allow them to be their most authentic selves and do whatever Froots their Loops by founding State Bicycle Co. just two years after graduating college. With the launch of this collaboration, they are hoping others will be inspired to do the same. "The bike we designed in partnership with Froot Loops is bright, happy and fun," said Mehdi Farsi, co-founder of State Bicycle Co. "Just like Toucan Sam, it reminds us that you don't have to do or be the expected. You can bring your own vibrant burst of color to the world just by doing what makes you most happy or 'Whatever Froots your Loops.'" Mimicking the iconic color combination of beloved wingman, Toucan Sam™, the bike offers eight different Froot Loops-inspired customization options for the wheels, seat, and hand grips, enabling fans to choose whatever look Froots their Loops. Retailing for $449, the limited-edition Froot Loops x State Bicycle Co. bike is available exclusively at statebicycle.com/frootloops. Froot Loops' partnership with State Bicycle Co. follows the launch of the Neff + Froot Loops Toucan Sam™ Shades and the Timbuk2 + Froot Loops limited edition tuck pack, as a part of a series of brand partnerships. 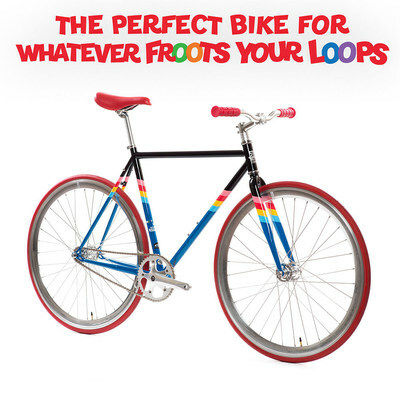 To learn more about all of the "Whatever Froots Your Loops" collaborations, follow Froot Loops, Neff Headwear, Timbuk2, and State Bicycle Co. on Facebook, Twitter and Instagram. At Kellogg Company (NYSE: K), we strive to make foods people love. This includes our beloved brands – Kellogg's®, Keebler®, Special K®, Pringles®, Kellogg's Frosted Flakes®, Pop-Tarts®, Kellogg's Corn Flakes®, Rice Krispies®, Cheez-It®, Eggo®, Mini-Wheats® and more – that nourish families so they can flourish and thrive. With 2016 sales of $13 billion and more than 1,600 foods, Kellogg is the world's leading cereal company; second largest producer of crackers and savory snacks; and a leading North American frozen foods company. And we're a company with a heart and soul, committing to help create 3 billion Better Days by 2025 through our Breakfasts for Better Days global purpose platform. To learn more, visit www.KelloggCompany.com or www.OpenforBreakfast.com and follow us on Twitter @KelloggCompany, YouTube and on our Social K corporate blog.